Size: 600 sq.ft. - 2000 sq.ft. 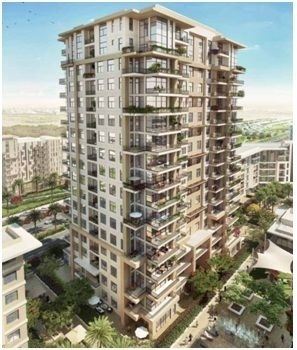 A 19 storeyed tower is being developed by Nshama Properties in the heart of Dubailand community Town Square. Town Square is a vast community of 31 Million Square Feet, a home to 3000 townhouses and 18000 residential apartments including 350 retail shop and F&B Outlets. The project named is Jenna Apartments which was announced in 2015. One of the best destination for residential home seekers established over 750 acres landscape. Jenna is positioned in the center of the development. Jenna apartments are size of 1 Bed, 2 Bed and 3 Bed overlooking the Central Park/main Town Square area. Jenna Apartments - The third development of Town square is architected with soothing glazed porcelain floors, open-plan or closed kitchen,built-in wardrobes, en-suite bathrooms, spacious living and dining areas that allow natural light.The tower features the premier apartments of Jenna by Nshama will offer 1-bedroom, 2-bedroom and 3-bedroom apartments compromised of 600 Sq.ft to 2000 Sq.ft. The address of Jenna is meticulously nestled in mid lush green spaces. Nshama realty has been offering world-class well established communities. One of the leading real estate groupsin Dubai.Their only aim is to bring a new lifestyle for all type of buyers by offering mega communities for families but will also provide a full-fledged, thriving range of lifestyle developments like restaurants, health centres, malls, retail stores, hotels, cafes, play areas, educational institutes, community parks and more. Nshama Properties is the one of largest real estate company and still growing with lots of projects under construction. Jenna is extraordinary as compare to other apartments of Town Square by having 27 Lush Parks, 64 Excellent Views &70 lavish apartments. It is nestled between Al Qudra Road and Emirates Road. * Well-connected via Etihad Rail and bus connections. Jenna apartments are right next to a new Vida Town Square Dubai hotel, Reel Cinemas cineplex and open-air cinema. The American University in Dubai is in close proximity to the neighbourhood of the project. The Rawda residences are today’s one of the most sought-after residential developments in Dubai. These affordable new homes are in the main square region of Town Square Township at Dubailand, United Arab Emirates. The project is established with unique facilities like Climbing walls, athletic spa, fitness centre, Skate Park, Adventure Park, community swimming centre, Splash Park, playgrounds, Indoor gym, jogging tracks, meditation centre right within the Township and many other basic amenities.